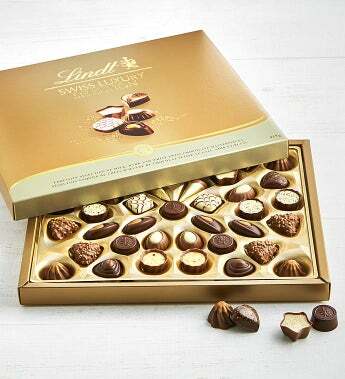 Lindt chocolate embodies the passion and expert craftsmanship of its Lindt Master Chocolatiers. This sophisticated collection of elegant European style milk, dark, and white chocolate pralines has been carefully crafted in Switzerland. Lindt Signature flavors inside include macchiato, carre de stracciatella, caramelita and perle de cacao. 40 pieces. Gift measures 13.75" x 11.25" x 11"
Lindt chocolate embodies the passion and expert craftsmanship of its Lindt Master Chocolatiers. This sophisticated collection of elegant European style milk, dark, and white chocolate pralines has been carefully crafted in Switzerland. Lindt Signature flavors inside include macchiato, carre de stracciatella, caramelita and perle de cacao.